Congress Forever 2014 is now Congress Infinity. All Congress Forever 2014 pre-order owners will now be Congress Infinity owners. To better reflect the future and nature of the game, it’s getting a new name. An early Test Release will be released to Steering Council members soon. Then, a Test Release will be released to all pre-order owners. Then, the game will be released officially. Initially, it will contain 2014 Senate and House. Updates will then continue to be added to the game. If you want to pre-order, click here. This is great news! I have been waiting for what seems like a long time for a Congressional SIM featuring the latest engine and enhancements. The Infinity family of games…I like that. As you can see, my ethuasim for this is extremely high. I look forward to testing it. Very very excited for this, thanks to the whole team! @Anthony, one of the many things that turned me away from Congress Forever 2010 was the text issue…that should be fixed with this game? Also, I hope, with this latest engine, you can continue making updates to it even as far as the next mid-term elections, instead of having to create a new Congress sim every two years….the lack of updates and a primary feature…long-term support for Congress Infinity and a primary feature somewhere down the line would be welcomed by the community. Another interesting feature would be a choice to control pacs like Senate Conservative Fund (http://www.senateconservatives.com/) for example…though, with the early test release and other things in line, maybe something from my suggestions could make its way into the game. Ah brilliant. I’ve waited months for this. 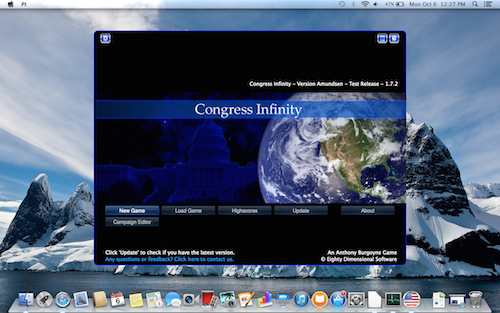 Congress Infinity uses a new graphics engine, so any text issues should be fixed with the new version. Thanks for the other feedback – noted.